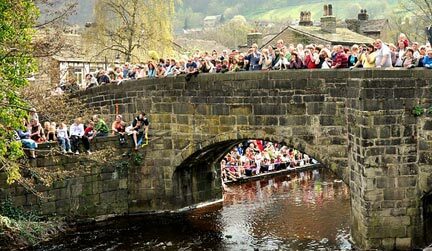 This year, Hebden Bridge’s packhorse bridge is 500 years old. And this landmark bridge, originally built to smooth the progress of trade, has seen Hebden Bridge become a fair-trade town with more than its fair share of creativity and innovation. Limited edition sets of postcards celebrating Hebden Bridgeiness will be issued throughout 2010. Look for them in local shops.Sponsored by frogs design and The Print Bureau. 500 voices singing on and around the bridge on Sunday 4th July. The event will also be part of Hebden Bridge Arts Festival. Images of many of the historical bridges of the area, in collaboration with members of the Hebden Bridge Local History Society.